Tubereuse 40 is named, like all their other offerings, in the (slightly annoying) Le Labo fashion, the ingredient with the highest concentration gives the name, and the number of ingredients in the formula is added behind. It most cases that means it smells not at all like its name suggests, and this case is no different – do not expect a tuberose scent here. Tubereuse 40 was created by Alberto Morillas and includes notes of ambrette absolute, bergamot, cedar, jasmin absolute, orange blossom absolute, mimosa absolute, oak moss absolute, petit grain, rose and tuberose absolute. I would probably have fallen very hard for Tubereuse 40, had I tested it in summer, since this is a lovely summery cologne-style orange blossom scent on a green, mossy-woody base. Opening with a lovely citrus accord, Tubereuse 40 moves into a floral heart of orange blossom accented with tuberose, that accent shifts towards tuberose with the passing of time. Tubereuse 40 is very pretty and my husband was uncharacteristically enthusiastic about it. (That might be in part due to sheer relief on his part, because I have been testing a lot of chypres recently, a genre he hates with a passion.) But he is right, Tubereuse 40 is very pretty and very easy to wear and at a 30% concentration, very longlasting, rich and luscious. If I were to travel to New York in springtime, I might be sorely tempted, although there are many very similar perfumes to be found. Atelier Cologne Grand Neroli comes to mind, as well as L’Artisan Parfumeur Fleur d’Oranger. On a side note: I cannot think of a perfume less ideal for New York. There is nothing that links this perfume to the city in my mind. Gaiac 10 is ideally suited for its place in Tokyo whereas Aldehyde 44 is just as ill-fitting for Dallas, as Tubereuse 40 is for NYC. I would simply switch the two. Aldehyde 44 seems to me the ideal NYC perfume, its elegance and sparkling darkness make a better portrait of this city. And the sprightly, happy and pretty Tubereuse 40 in all its flowery glory would make a good, refreshing treat in the Dallas climate. As soon as my seasonal infatuation with dark and heavy scents has worn off again, as soon as the long, dark nights of winter are getting to me, as soon as the cold has thoroughly penetrated to my core, I am certain that I will seek out Tubereuse 40 that will shine like a tiny beacon in the depths of my sample box. I imagine, it will bring a lot of light and sunshine to the dreariest days of winter. This entry was posted in Citrus, Cologne, Floral, Fragrance Reviews, Le Labo, Orange Blossom, Tuberose and tagged Alberto Morillas, citrus, cologne, Fragrance, Le Labo, Orange Blossom, Perfume, Review, Tuberose. Bookmark the permalink. beacon ?! it will be a full bottle lighthouse after thanksgiving in the city. if i can buy my way out of some of the smell-experiences i have had i will gladly do so. if only it wasn’t rue cambon but cru jambon ….. So perhaps Katie Puckrik is right when she states that the smell of smoked meat will always be a man’s favorite 😉 If so, I guess we should be happy that men aren’t that difficult to please. No need to wear the smell of bacon. A fruity floral or anything with methylbenzodioxepinone will do. I will have the bacon on the side along with a medium rare steak and a baked potato. And they say we are going to have an arctic winter, so I imagine we will all be rummaging for our beacons imminently! I hope the bleaching wasn’t too painful! Arctic winter? Oh no, I like fall, but too much cold is so depressing. I just ordered all these city samples so I can check them. These names of perfumes are so misleading and connections with cities not so well-chosen. I’m not quite sure why they are doing this. I guess all this doesn’t help rise their sales. Yes they have figured it out now that this works ;-), but city exclusivity on itself outside this time limited offer? any of these niche lines can survive. But apparently it works out for them and that is a good thing! When asked about the frustration the City Exclusives concept causes in an interview on CaFleurBon, Fabrice Penot of Le Labo said “..why are we part of this generation that can have everything all the time from anywhere and can’t handle a frustration from our consuming power ?” This rather irked me, I must admit. 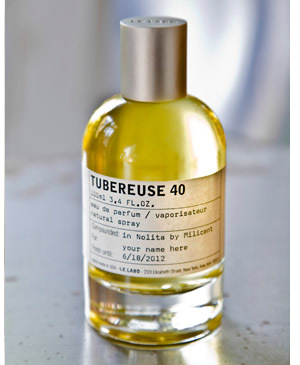 Anyway, Tubereuse 40 sounds as pretty as it is mis-named and I love the photo you chose for it, B.
I wish Le Labo would stop creating a lot of noise around their perfume with so many quirks, like misnaming, exclusivity, provocative interviews, bothersome “fresh” mixing, etc. Are they so insecure about their perfumes that they do not believe them to work without all the hullabaloo surrounding them? I say, B, whenever any of us next finds ourselves wrestling with a full bottle lemming, we must remember that a “frustration from our consuming power” is character-building..
Just look at us. Now we all perfume freaks talk about them. That’s what they wanted. Tubereuse 40 is nice, but like you say, not spectacular in any way that would justify the price!